Omar’s comments at a D.C. bookstore forum last week have drawn criticism from senior Democrats, including Rep. Nita Lowey, who chairs the House Appropriations Committee, and Rep. Eliot Engel, who chairs the House Foreign Affairs Committee. Both are Jewish. During an event at “Politics and Prose” in the District, Omar discussed what she portrayed as unfair criticism of her questions about how the U.S. deals with Israel. “I want to talk about the political influence in this country that says it is OK for people to push for allegiance to a foreign country,” said Omar, one of the first two Muslim women elected to Congress. 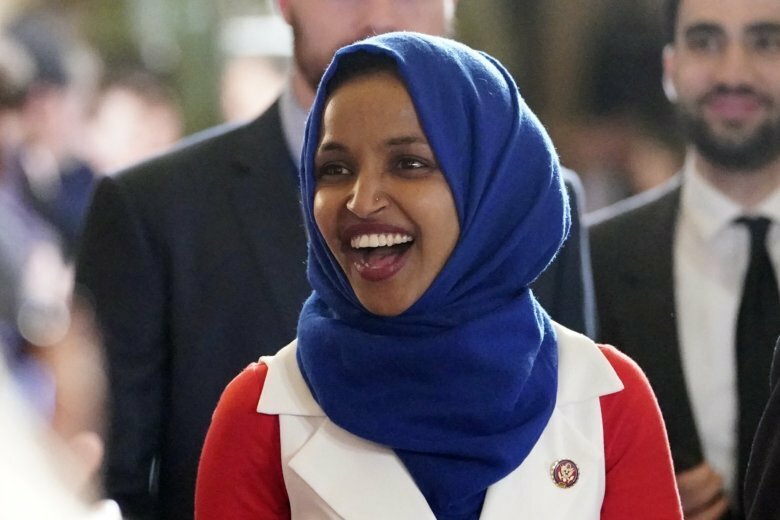 Engel said Friday that Omar should apologize for what he called a “vile, anti-Semitic slur.” Lowey tweeted over the weekend that she was “saddened” by Omar’s comments and urged her to retract it. But Omar declined to back down in a response to Lowey. Omar also tweeted that her opposition to Israeli Prime Minister Benjamin Netanyahu’s leadership shouldn’t be seen as anti-Semitism. Omar is a member of the House Foreign Affairs Committee. In a tweet on Monday, House Minority Whip Steve Scalise, R-La., suggested she should be taken off that panel. “Resolutions are all well and good, but Speaker Pelosi is clearly afraid to stand up to Rep. Omar if she continues to reward her with a plum spot on the Foreign Affairs Committee,” he said. The latest flap follows a tweet Omar made last month, which led her to apologize after criticism from Republicans and Democrats, including House Speaker Nancy Pelosi, D-Calif.
Omar tweeted that a lack of criticism from U.S. lawmakers was “all about the Benjamins” and the financial influence of AIPAC, the bipartisan organization that promotes the U.S.-Israel relationship. The vote on the resolution was first reported by Politico on Monday. The exact language was still being worked out by lawmakers. The Anti-Defamation League wrote a letter to Pelosi on Monday that called for a resolution condemning anti-Semitism.